Pakistan's Islamic alliance Muttahida Majlis-e-Amal is on the verge of a split due to a deepening rift between leaders of its two key constituents. The differences between the leaders of the Jamaat-e-Islami and the Jamiat Ulema-e-Islam have been exacerbated by the stand of the two parties over the dissolution of the assembly in the MMA-governed North Western Frontier Province to discredit President Pervez Musharraf's re-election in the October 6 poll. Pakistan and India are expected to finalise agreements on inadvertent border crossers and accidents at sea during talks on conventional confidence-building measures slated for October 18 in New Delhi. Determined to “reinvigorate” India’s ties with African countries, Prime Minister Manmohan Singh arrived in the Nigerian capital today on the first leg of his two-nation visit. India may have the second fastest growing economy in the world but it still has a long way to go in eradicating hunger where it is ranked at the 94th position behind neighbouring China and Pakistan, a global report has said. Mount Everest, the king of mountains, is now poised for a makeover. In 1953, when Edmund Hillary and Tenzing Norgay Sherpa became the first men to summit the highest mountain in the world, Mount Everest was considered the ultimate challenge in adventure and human endurance. Ending weeks of speculation, Australian Prime Minister John Howard today called a general election for November 24, claiming it’s all about the “right leadership”. The 68-year-old, in power for 11 years but lagging well behind opposition labour leader Kevin Rudd in opinion polls, said only he’d be able to lead Australia into future and continue the country’s resource-driven economic boom. “Love me or loath me, the Australian people know where I stand on all the major issues of importance to their future,” the conservative Howard told reporters after visiting the Governor-General in Canberra. A 44-year-old man tried to attack German President Horst Koehler today, grabbing his lapels before being restrained by bodyguards, the police in Frankfurt said. Koehler, who was not hurt, was leaving an awards ceremony for the Frankfurt Book Fair at midday with his wife when the Romanian man who resides in Germany accosted him, a spokesman said. China has cancelled December human rights talks with German Chancellor Angela Merkel, the Foreign Ministry said today, just weeks after Beijing was incensed by her meeting with the Dalai Lama. Pakistan's Islamic alliance Muttahida Majlis-e-Amal (MMA) is on the verge of a split due to a deepening rift between leaders of its two key constituents. The differences between the leaders of the Jamaat-e-Islami and the Jamiat Ulema-e-Islam have been exacerbated by the stand of the two parties over the dissolution of the assembly in the MMA-governed North Western Frontier Province (NWFP) to discredit President Pervez Musharraf's re-election in the October 6 poll. The Jamiat Ulema-e-Islam and its leader Maulana Fazlur Rehman dragged their feet on the move, allowing the opposition PML-Q in the province to move a no-confidence motion against chief minister Akram Khan Durrani and effectively stalling the dissolution of assembly till the presidential poll was held. The MMA's supreme council or top decision-making body has called a meeting here on October 22 in a last-ditch effort to keep the coalition together for the upcoming general election due by mid-January. During the meeting, the Jamaat-e-Islami and its partners will ask Rehman to either leave the alliance or stop supporting Musharraf, the Daily Times reported today, quoting sources in the MMA. The meeting, which is expected to be stormy, will discuss the dissolution of the NWFP assembly after the presidential election despite the Jamaat-e-Islami's demand that it be dissolved prior to the poll, the sources said. Former Prime Minister Benazir Bhutto, who is scheduled to return to Pakistan on Thursday after nine years in exile, and her husband may reclaim hundreds of millions of pounds frozen in Swiss bank accounts. Bhutto and her husband Asif Ali Zardari may reclaim the money in their accounts which were frozen as they were alleged to have amassed a fortune from kickbacks on government contracts during her two terms as Prime Minister, a news paper reported quoting senior anti-corruption officials in Lahore. Their assets allegedly included a 10-bedroom, mock-Tudor Surrey mansion and £740 million in Swiss bank accounts, the report said. Hassan Waseem Afzal, a high-flying civil servant who led the Bhutto investigation for 10 years, said last week that he believed the deal with President Pervez Musharraf to drop the corruption charges would unlock the frozen accounts. The accounts were registered in the names of Bhutto’s mother Begum Nusrat Bhutto and Zardari, a former minister. But Afzal said the Pakistan government and a Swiss magistrate had obtained evidence that Bhutto herself was a beneficiary. Pakistan and India are expected to finalise agreements on inadvertent border crossers and accidents at sea during talks on conventional confidence-building measures (CBMs) slated for October 18 in New Delhi. Officials believe finalisation of the two agreements would give a major boost to the talks between the two countries. Sources said two separate teams of experts led by Foreign Affairs Ministry officials would leave soon after Eid for New Delhi to hold talks on conventional and nuclear CBMs with Indian experts on October 18 and 19. Aizaz Ahmad Chaudhry, the director-general for South Asia at the Foreign Affairs Ministry, is to lead the first team, which will include up to five officials, mainly from the Foreign Office. The team will hold talks on conventional CBMs with Indian officials led by the joint secretary for Pakistan, Afghanistan and Iran, TCA Raghvan, on October 18. The second team, to be led by additional secretary (UN) Khalid Aziz Babar, will hold talks on nuclear related CBMs on October 19 with Indian officials. The Indian side will be headed by additional secretary (International Organisations) K C Singh. He is on a five-day visit to Nigeria and South Africa, where he will attend the second three-nation summit of IBSA (India, Brazil and South Africa) starting October 17. Jawaharlal Nehru visited Nigeria in 1962 and Atal Bihari Vajpayee in 2003 but for attending the Commonwealth Summit. Several agreements are expected to be signed between the two countries. PM said in a pre-departure statement in Delhi that his journey signified India’s desire to “re-invigorate its ties” not only with Nigeria but the entire African continent. According to the latest Global Hunger Index 2007 from the International Food Policy Research Institute (IFPRI), although India has improved its score to 25.03 on the index compared to 33.73 in 1990, it is lagging behind China and Pakistan ranked at the 47th and 88th positions, out of the listed 118 countries. During the 1990-2007 period, China improved its score to 8.37 from 12.77 while Pakistan improved to 22.7 from 25.73. The index is mainly based on proportion of undernourished population, prevalence of underweight in children under five years and the under-five mortality rate. “One in seven people go to bed hungry every day. That’s 854 million people worldwide. Hunger is one of the world’s major problems and, therefore, one of its most important challenges,” the report’s author said. Besides, India’s score on the progress indicator of the Global Hunger Index is 0.496. The country managed to reduce hunger by 8.7 since 1990 whereas the reduction target is 17.6 for the period from 1990-2015. Libya is at the top of the list with a score of 0.87 whereas it had a score of 2.70 in 1990. Mount Everest, the king of mountains, is now poised for a makeover. In 1953, when Edmund Hillary and Tenzing Norgay Sherpa became the first men to summit the highest mountain in the world, Mount Everest was considered the ultimate challenge in adventure and human endurance. But with increasing leaps in technology and human imagination, the king of mountains is now poised for a makeover - as the king of showbiz! The transformation started on Saturday when a group of gritty musicians began a journey to the 8,848-m mountain, which is to turn into their stadium in less than 10 days. Under the aegis of Love Hope Strength Foundation, a British-American NGO, a team of 40 musicians, mountaineers, artistes and supporters began their journey from Kathmandu to the base camp of Mount Everest where they will hold the world's highest gig at 18,000 feet. Besides hoping to climb into the Guinness Book of World Records, the music makers have another aim - to raise money for the Bhaktapur Cancer Hospital, Nepal's only hospital dedicated to cancer treatment. "Everest Rocks" aims to be the coolest show on record, fusing music with sports, technology and philanthropy. The band aims to hike to the base camp during the day and at the end of the trek in the evening, make acoustic recordings that would be fed to iTunes. After a full-fledged concert at the base camp on October 23 or 24, depending on the weather, they will return to Kathmandu for a grand finale at the Durbar Square on October 29. "Everest Rocks" will act as a trailblazer for other showbiz happenings. Next year, it will be Vietnamese who will take Everest dos to a new height. Vietnam plans to have its national flag fluttering on the summit - as part of a reality show. The preparations started in the capital this month when over 1,000 people auditioned at the Military Zone Stadium for the new reality show "Everest Vietnam 2008". The reality show will ultimately choose four lucky survivors from the aspirants who will have to climb four peaks in four different countries during the trial run. 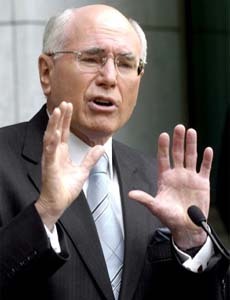 Ending weeks of speculation, Australian Prime Minister John Howard today called a general election for November 24, claiming it’s all about the “right leadership”. The 68-year-old, in power for 11 years but lagging well behind opposition labour leader Kevin Rudd in opinion polls, said only he’d be able to lead Australia into future and continue the country’s resource-driven economic boom. “Love me or loath me, the Australian people know where I stand on all the major issues of importance to their future,” the conservative Howard told reporters after visiting the Governor-General in Canberra. Howard said the country was enjoying a remarkable level of national prosperity, but promised the best years could lie ahead. A 44-year-old man tried to attack German President Horst Koehler today, grabbing his lapels before being restrained by bodyguards, the police in Frankfurt said. Koehler, who was not hurt, was leaving an awards ceremony for the Frankfurt Book Fair at midday with his wife when the Romanian man who resides in Germany accosted him, a spokesman said. The bodyguards instantly snatched the man away. “He was only able to get his hands on the President by the lapels, but the bodyguards got him immediately,” the police spokesman said. A German Foreign Ministry spokeswoman, speaking on condition of anonymity, confirmed reports that the planned meeting in Beijing had been cancelled “in the last few days,” but refused to give reasons. But China criticised Merkel for holding a meeting in Berlin in late September with the Dalai Lama.